In theory electronic books, or e-books, are only data files containing textual information. 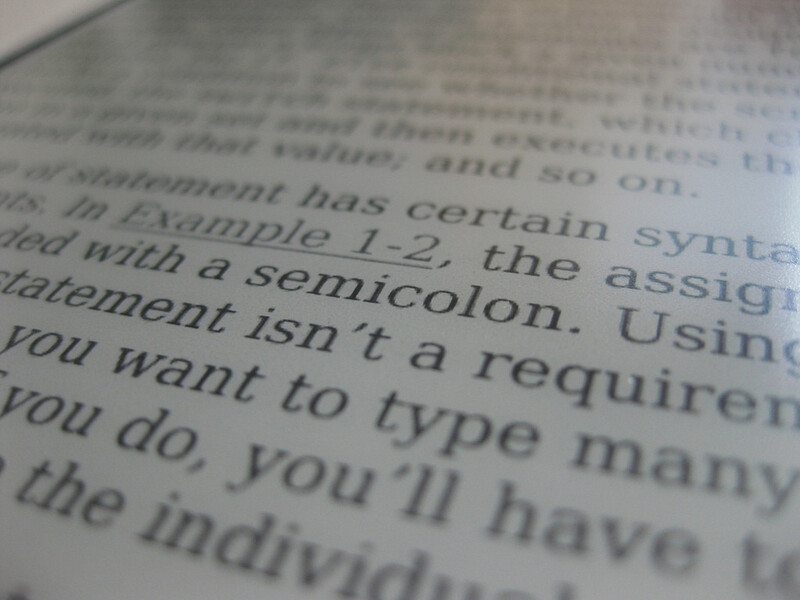 The distinction between digital texts and e-books is essentially arbitrary. Technically, the concept of an e-book is as old as the concept of digital text. Utopian ideas of unrestricted and lightning-fast dissemination of information can, and have been, associated with e-books just as they have been with other forms of digital knowledge. These ideals have been actualized in the Open Access (OA) movement, but are yet to materialize in overarching policy decisions. The use of e-books is growing rapidly, but many difficulties lie between their current use and their inherent potential. Librarians are at the forefront of this struggle, and they have extensively mapped current issues plaguing this fledgling medium. What follows is a two-part introduction to some of the most debated points. The most obvious issues related to digital content are ones related to copyright. As with movies, games, music and software, book publishers, too, expect to be able to make a profit from their products. Taking copies of printed volumes has been common since affordable copiers found their way into practically every office anywhere. Still, copying a book page-by-page is a lot of work, and can only be done with access to a physical copy – either legal or not. Copying digital materials, however, is effortless and inexpensive by default. Initially, publishers shunned digital publishing in fear of having the fox stealing their gold-egg laying geese.. Eventually they understood the benefits of the platform: zero printing and delivery costs enabled publishers of e-books to explore previously untapped market niches. To prevent illegal copying and other misuse, digital rights management (DRM) software were developed and applied. The introduction of DRM is the reason e-books exist as a separate category from regular text files. Absolutely distinct from ordinary digital text files, e-books have become entire systems of indexing, monitoring, permission control and automatic data deletion. This extra burden of code has resulted in two sets of issues. Firstly, an e-book demands more from those devices used to host and manage the e-book than the content warrants. This issue is relevant to both the servers of the host (the publisher, the retailer, the library) and the device of the end user (reader, researcher). Secondly, without a commonly adopted format, the integration of a variety of publisher DRM systems into a single system (for example, in a library) is a daunting task. To make things simpler, and also to earn revenue, commercial e-book management systems have emerged. By integrating the output of several publishers to a single end-user interface, these systems have the potential to save librarians a great deal of valuable time and effort. Unfortunately, no single system provider has contracts with all the publishers of e-books a library wants. In practice, libraries have to deal with a number of interlocking, sometimes overlapping systems. Correction: The text was updated to a newer version on 7th April 2015 GMT 0.46.